With two HDMI inputs nestled among the more standard DVI and VGA sockets, plus built-in speakers and a remote control, the Eizo Foris FS2332 monitor is clearly designed to double as a television. As a result, it doesn't look quite as glamorous as dedicated LED monitors. The infrared port for the remote control and built-in speakers makes it a rather bulky and ugly device – at least on the outside. Thankfully, the hardware powering this panel suffers none of the compromises that plagued earlier monitor/HDTV hybrids. 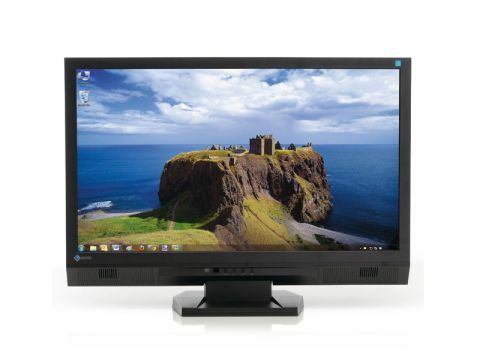 The Eizo Foris FS2332 uses an IPS panel rather than the more popular TN display found in most LCD monitors. The screen remains visible at 178 degrees vertically and horizontally with a contrast ratio of 1000:1. While it might not be much use for everyday office tasks, it means a group of people can gather around this monitor and watch media without any problems. This monitor isn't perfect though. While the remote control is a nice addition, it contains the only menu button. This means that if you lose the remote – not hard considering how tiny it is – you'll be unable to change any of the settings except volume and input. Another unusual addition is a small transparent square next to the IR receiver at the front of the device. This is a brightness sensor – known as the Auto EcoView – that detects the brightness of the room. When the lights are dimmed, the screen adjusts its brightness accordingly. This is slightly distracting when ambient light levels change quickly, but over the course of a day the results are subtle and work well. Most importantly, image quality and colour reproduction are great, with 1,920 x 1,080 native resolution and a contrast ratio of 1,000:1.